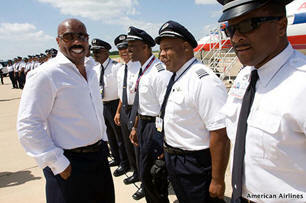 June 16, 2011 - For the third year in a row, American Airlines will join with entertainer Steve Harvey to host more than 100 boys from Dallas and across the country, June 16 – 19, during the Steve Harvey Mentoring Weekend at the Steve Harvey Ranch in Little Elm, Texas. Attendees learn about career opportunities in aviation. Steve Harvey, American Airlines employee volunteers, including African-American pilots and aircraft mechanics, will be on hand to meet and mentor the teenage boys, who will learn about the skills needed to become a pilot or an aircraft mechanic. The teenagers will also gain exposure to, and learn about, other careers in the aviation industry. "American is proud to be a part of such an important and potentially life changing event," said David Campbell, American's Vice President - Safety, Security and Environmental. "Steve Harvey and the many American Airlines employees, who so unselfishly give of their time and energy, are making a huge impact on the future of the young men who will be in attendance." American is involved in several programs designed to expose students to aviation careers, including a Pilot Internship Program for college students majoring in aviation studies, plus a summer camp at the C.R. Smith Museum in Fort Worth for children in grades 5-8. At this year's event, the teens, ages 13 to 18, will learn about the skills required to become a pilot through instruction from American Airline pilots and through interactive flight exercises using flight simulation gaming machines. The young men will also gain some hands-on experience learning what it entails to be a mechanic through various projects under the direction of American Airlines mechanics. Harvey, an actor, comedian and best-selling author, created the Steve Harvey Mentoring Weekend to support boys who are being raised in households led by single moms. Harvey called on celebrity friends, business leaders and corporate sponsors such as American Airlines to lead motivational sessions on fitness and health, making the best impression and other areas of self development. Over the four-day weekend, the teens will also participate in activities such as tennis, fishing, golf and paintball. "The statistics all support the fact that a young man raised in a home with an active father is so much more likely to experience success," Harvey said. "All the young men who are attending this camp come from homes without fathers. If we can reach them and provide them with options to achieve, then this weekend will be a success not just for them, but for future generations." The mission of the Steve Harvey Foundation is to mentor young men through the Principles of Manhood to enable them to achieve their dreams and become better citizens, better fathers, better husbands, better MEN who are emotionally, politically and economically strong. Hosting the inaugural Steve Harvey Mentoring Weekend for Young Men during Father's Day Weekend in 2009, Harvey brought 100 teenage boys and their guardians from around the country to his ranch in Dallas. The program's success inspired Harvey to expand his mission nationwide and create 5 satellite mentoring programs for 2010 in Las Angeles, New York, Atlanta, Chicago, Charlotte.